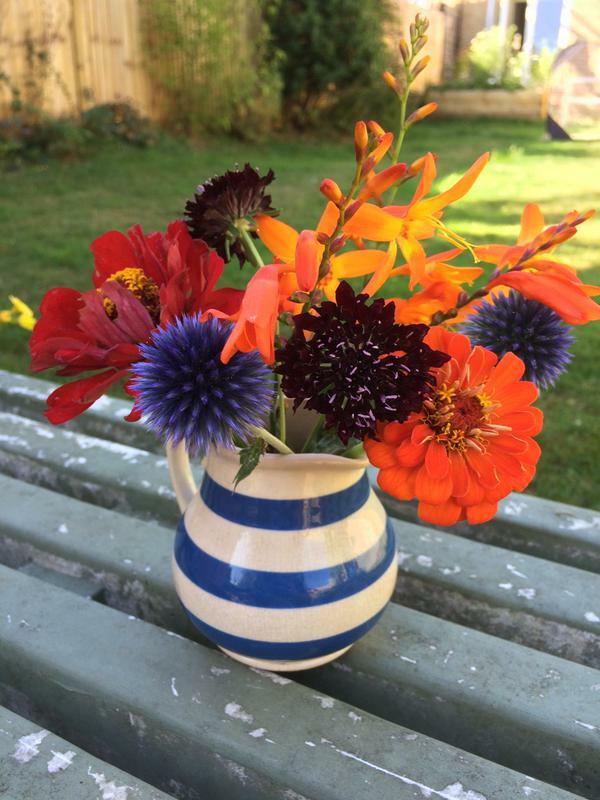 Thanks to @BessyBrad (Twitter) for sharing this pic…some fine Zinnia and Scabiosa in there too…..top bananas. Higgledy Flower School 2016. #33. Echinops. 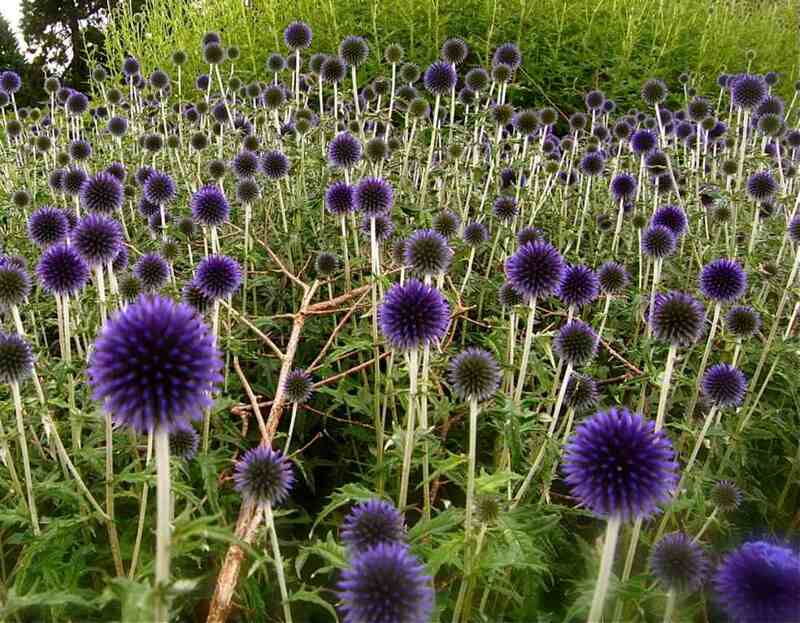 Echinops saunter through their flowery universe whilst channelling the vibe of a medieval mace. The silvery blue, spiky chaps are friendly in each and every other way however and seem to have an understanding with the bees and the butterflies who hang out around them all summer long. 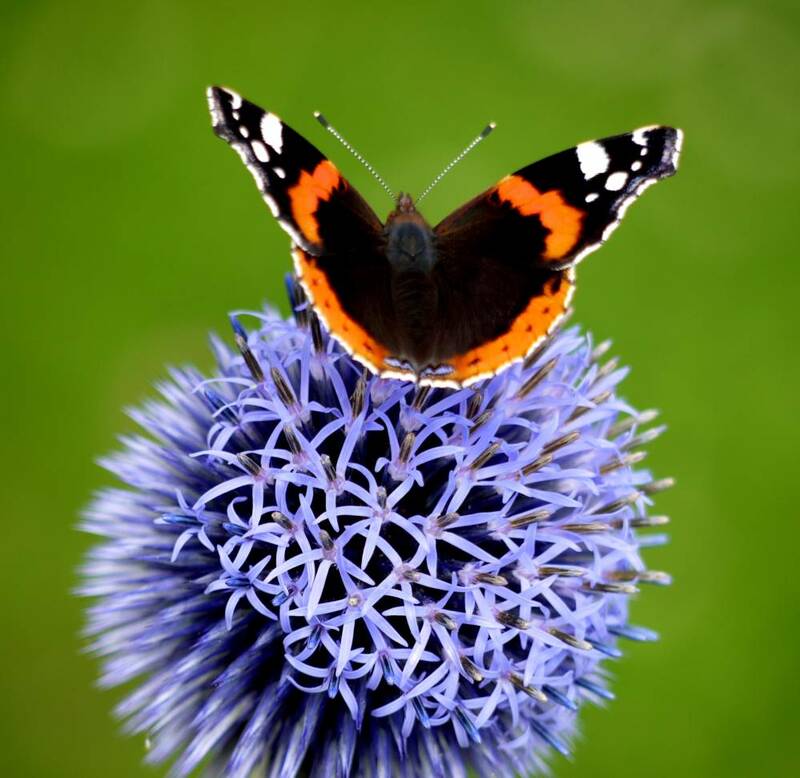 Echinops are perennials…you may get a few flowers in the first year but you may not…but after the first season you will have an abundance of the beasties year in year out. They self seed like troopers too…. Red Admiral (I think). Photo credit: Unknown. *I sow mine in pots in the spring but you can sow from Autumn too. *I plant out my spring sown seedlings after the frosts about a foot apart. *Echinops are happy in a wide range of soils but seem to prefer well drained ones….and will not grumble if the soil is poor. *Harvest the first flush of flowers and a second flush will trot along in a few weeks time. They should flower from early August. 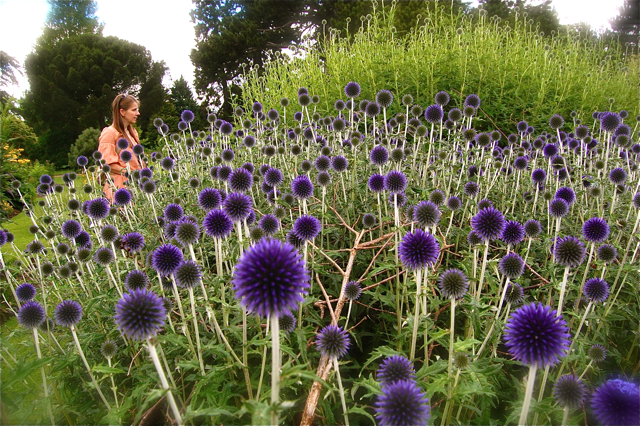 Echinops in the Cambridge Botanical Gardens…..many moons ago….with the lovely Karen Wells. …and here’s a photograph from a competitor’s website…I wonder where they got that from!!! ;) ‘Seeds of Eden’…naughty naughty! *Should you wish you can divide the plants in the spring. *Echinops are most excellent when dried and will make your arrangements looks as though they have been sent back from a glorious utopian future. …In Greek, ‘Echinops’ translates as ‘like a hedgehog’…..it’s funny how Greek names sound so much more clever when you don’t know what they mean…. Now if you are interested in growing some Echinops from seed…I might be able to help you out…I know a fairly decent fellow who may have a few packets of ‘Ritro‘…he sells them at £2.25 for 50ish seeds. ‘The Allotment’, New Category. Hardy Annuals Flower Seed Sowing. ‘Bucket Test’. Nasa.